CECO Pipeline Services specializes in all aspects of pipeline integrity work. We can provide crews that are safe and productive for jobs ranging from small-scale anomaly dig projects to major recoat projects. Our crews range in size from six to 80 men. We are the cost effective, safe solution for all your integrity needs. 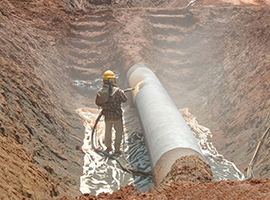 We have extensive experience coating pipe with two-part epoxies. We can do this with in-house spray rigs which are built for production and minimized waste. We understand that when your pipeline is exposed you are likely operating under reduced pressures and limitations you don't want or need. We can get in and get out quickly - all the while conducting our business in a safe manner. All of our programs are developed to promote a safe working environment for customers, employees, the public and the environment. We invest in our employees through enhanced training to increase skills and cross-functionality. Our corporate HSE compliance training and performance reviews assure a safe and productive work environment.